Pandit VidyaShankar obtained his Rig & Yajur Veda education at Chidambara Ashrama and Magadi Karnikara Vaidika Dharma Patasala in Karnataka, India. He participated in such programs as Koti Gayatri Yagna in Bangalore and Vishwashanti Maha Yagna in New Delhi. He learnt Pourohitya, Agama Shastra & Panchadasa Samskaras in Bangalore between 1986 - 1989. 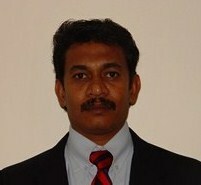 He worked as an Agama Pundit at the Ganapati Temple, Nashville, Tennessese from 1993 - 2003. 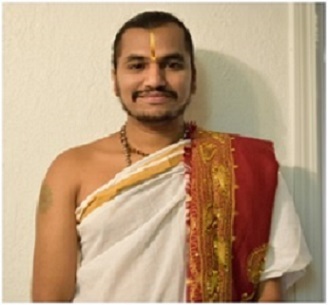 He has participated in Kumbhabhishekams and Varshikotsavams at Hindu temples in Atlanta, Dallas, Livermore, Bakersville, St. Louis, Cincinnati, Louisville, Huntsville and Birmingham. Pandith Badari Narayana comes from a traditional priestly family, who are serving from generation to generation. His father is head priest at in Sri Gurugaayoorappan Temple in Morganville NJ. 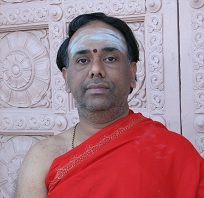 Pandith Narayana has worked in numerous temples in India and US before joining Hindu Temple of Omaha. Most Recently Mr. Narayana had worked close to 12 years in Hindu Temple of Central Illinois (Peoria) before joining our temple. He has participated in many Pranaprathista’s and Kumbabishekam’s in India and US. He was part of Navagraha Pranaprathista and Rajagopura Pranaprathista in Peoria as well. Pandith Narayana obtained his Veda and Aagama knowledge from his Father Krishna D. Bhattar and his maternal uncle Sampathkumar Bhattacharya are just a few of many who has been great teachers in his life. Pandith Narayana can perform all rituals and temple services. Pandit Laxmikanth Ji serves as a priest in our Temple. Prior to joining the Hindu Temple, Pandit Laxmikanth Ji was working as a senior priest in Shirdi Sai Temple of Atlanta, GA. He also worked as various temples in India before moving to the USA. Pandit Laxmikanth ji hails from Karnataka; he comes from a traditional priest’s family. He has obtained his education in Rigved Kramanth & Sanskrit Sahitya, Pancharatra Agama & Shiva Agama Prayogam, Yajur Veda Panchadasha Samskara & Vaidika Jyotishya Shastra ( Astrology) in Karnataka Between 1996-2007. 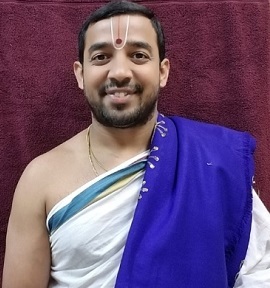 Pandit Laxmikanth-ji is well-versed with Hindu Rituals and Puja services such as Shodash Samskara, Pranaprathistha, Chandi Path & Homam, Sudarshana Homam, Udakashanthi, Marriage ceremony, Grihapravesham, Sathyanarayana Puja, Shasti purti, Navagraha Shanti/Homam, Upanayanam, Laxmikubera Puja, All Vrath’s and other pujas. He does both South-North pujas with their tradition. He has participated in Koti Kumkumarchana, Sanketik Ashvamedh Yagam, Ati Rudram, Sahasrachandi Yagam, Maharudram, Sri Chakra Mahameru Yagam, SriRam Tarak Yagam, Sri Ramayana Path and Koti Rudra Yagam. Fluent in Kannada, Marathi, Hindi, Telugu, English, Sanskrit and Konkani. He is also learning Tamil & Gujarathi. He started his career as Sthapati with V. Ganapathi Sthapathi and Associates. He worked as Sudai Shilpi in the renovation of more than 50 temples around Tamil Nadu under the direction of Sri. Venugopalaswamy Kainkaram Trusy and Indian Cultural & Heritage Trust, Chennai, India. He has worked in the construction and maintenance of several temples in India and abroad for over 20 years. He has won several titles and certificates of honor and excellence for services rendered in this traditional field. He currently handles all the facility maintenance and administration activities at the hindu temple.